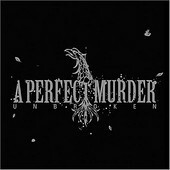 A Perfect Murder is a metalcore outfit whose 13-track release is laden with the kind of unbridled fury and metallic might that fits right in amongst the Ozzfest crowd. This Canadian quintet has garnished a slew of comparisons, as influences from Entombed to Down to Earth Crisis (whose singer Karl Buechner guests on Unbroken) are very much apparent. While APM isn't one the most innovative bands on the circuit, the sheer power wielded on such cuts as "Speak Without Faith" and the stoner-esque power groove of "Die With Regret" leave undeliable marks both in your head and on your back. With a heavy hand in both the stoner and metalcore genres, APM's lethal combination sounds like a doped-up Hatebreed or a really pissed off version of Crowbar, which in either case, are both dangerous entities.